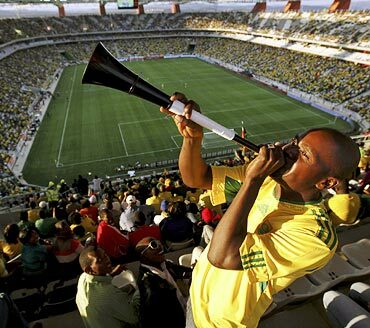 Cursed as the "devil's trumpet" for their ear-piercing drone, vuvuzelas nonetheless sold in their hundreds of thousands and were embraced as a symbol of South Africa's World Cup and African soccer culture. No previous World Cup has managed to define itself by a single object in quite the same way as fans have blasted vuvuzelas across the cities and townships of South Africa and from Buenos Aires to Berlin. With the next World Cup due to be held in carnival and celebration-loving Brazil in 2014, many predict the vuvuzela's future is assured, although some other sports have already banned it from stadiums. In South Africa's airports multiple plastic vuvuzelas protrude from the rucksacks and suitcases of departing fans and boxes and boxes of the horns are still stacked up at market stalls as fresh imitations arrive from China. "The vuvuzela noise was crazy but I didn't buy these ones to blow, I'm taking them home as presents for my kids and as a memento," said 48-year old Dutch fan Andre Verhoef, waiting at Cape Town airport with two bright orange vuvuzelas poking out of his hand luggage. Even if it appears in Brazil, whether the horn will ever sound with as much intensity and volume again is questionable. Players said the buzzing made it impossible to communicate with each other on the pitch, stadium spectators worried about the damage to their hearing, and television viewers rued the lack of chanting and cheering which usually defines the ebb and flow of a match. But the vuvuzela has a powerful defender. FIFA president Sepp Blatter rejected calls for them to be banned, saying they were a typical and loved feature of South African football. Neil van Schalkwyk, the plastics expert who first developed the vuvuzela in its current form believes they could be much less irritating if blown to a certain rhythm in the stadium, or in echoing blasts from one stand to another. "We've thought about introducing lights in stadiums to indicate when fans on one side of the stadium should blow their vuvuzela so there is more of a pattern," he said. As the World Cup progressed to its later stages the vuvuzela did seem to be played at times with a little more finesse, or at least in blasts corresponding to the action on the pitch. 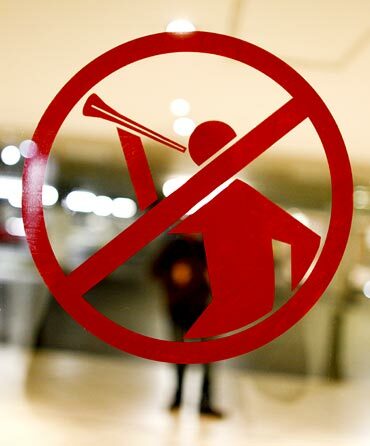 But in other sporting arenas it is clear the vuvuzela is a nuisance which cannot be tolerated. New Zealand stadium authorities have banned the horn from this weekend's rugby Tri-Nations opener between the All Blacks and South Africa. 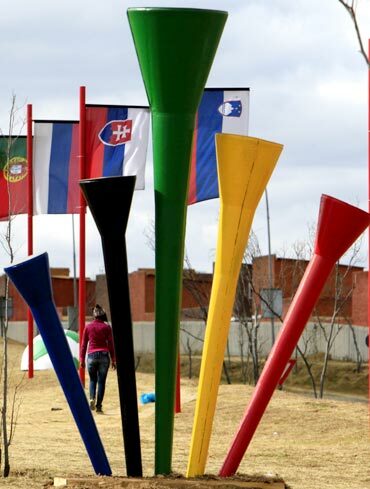 London Olympics organiser Sebastian Coe has said he wants a vuvuzela-free London Olympics in 2012 to preserve the silence and tension in the build-up before events and the vuvuzela was banned from the genteel grass tennis courts of Wimbledon. Even if its popularity fades -- the vuvuzela certainly showed the world one thing during the World Cup. As 22-year-old Katlego Makgoane put it while blowing and waving her vuvuzela wildly in Cape Town: "When South Africans celebrate they really go for it."